A RIFT VALLEY IS A trenchlike basin with steep parallel sides. The valley is essentially a down-faulted crustal block (grabben) between two parallel faults. A rift valley is different from an ordinary grabben for its remarkable length and depth. Such extraordinary basins typically occur where tectonic plates diverge. The release of Earth’s interior energy creates most rift valleys in the processes of seafloor spreading or continental rifting. Igneous intrusions and volcanism accompany the rifting process. According to the theory of plate tectonics, convective movement of material in the asthenosphere transfers Earth’s interior energy to the lithosphere, causing sections of the lithosphere (plates) to rift (tear) and slide laterally. Most rifting takes place over the rising limbs of convection cells in the asthenosphere where low-density material upwells beneath the lithosphere. Some of the rising material is molten and pushes upward into the lithosphere to form new crustal rock. The rest of the material remains in convective flow; sliding laterally until gravity pulls it into the cell’s descending limb. Rift valleys are caused by rifting continents. Continental rifting results as Earth’s interior heat collects beneath a thick continental crust. Thermal expansion or swelling of the crust causes a complex system of highelevation normal fault (grabben) valleys. The basinand-range topography of the North American Great Basin region might represent thermal rifting of a sort that has since dissipated. As rifting proceeds, Earth’s crust stretches and thins and large blocks displace along tensional fractures paralleling the rift margins. A modest amount of volcanism and igneous intrusions accompany the rifting, as magma pushes into the fractures and onto the surface. These land-based rift valleys or basins represent the first stage in the origin of an ocean basin. The best example of this initial stage is the East African rift system. Rift valleys on the seafloor. As Earth’s lithosphere continues to respond to driving motions in the asthenosphere, copious amounts of basaltic magma injects into the parallel tensional fissures and cools to form dense, heavy rock. The additional weight of the new rock deepens the floors of the rift valleys so that the sea inundates them. The Red Sea is a long, linear sea and is an example of this stage of rifting. The narrow basins of the Dead Sea and Sea of Galilee are continental extensions of RED SEA rifting. The broader present-day oceans are results of long-term rifting and seafloor spreading. Enormously deep rift valleys slice along the axes of huge midocean ridges where the spreading takes place. ICELAND, which is a volcanic exposure of the Mid-Atlantic Ridge, has a readily observable rift valley of this kind. Ancient rift valleys on passive continental margins. Some rift valleys that formed in the initial stage of rifting remain on the margins of separating continents. Typically, these basins fill in with sediment and become parts of submerged continental shelves. However, local geological situations sometimes preserve fragments of these basins on land. The Triassic Lowland of MARYLAND, PENNSYLVANIA, and NEW JERSEY is a classic example. The Lowlands are an area of rolling land and low ridges. They are remnants of down-faulted basins produced as the supercontinent of Pangaea rifted open during the Triassic and Jurassic periods, about 200 million years ago. Similar Pangaea rift basins occur along the east coast of North America from Labrador to GEORGIA. 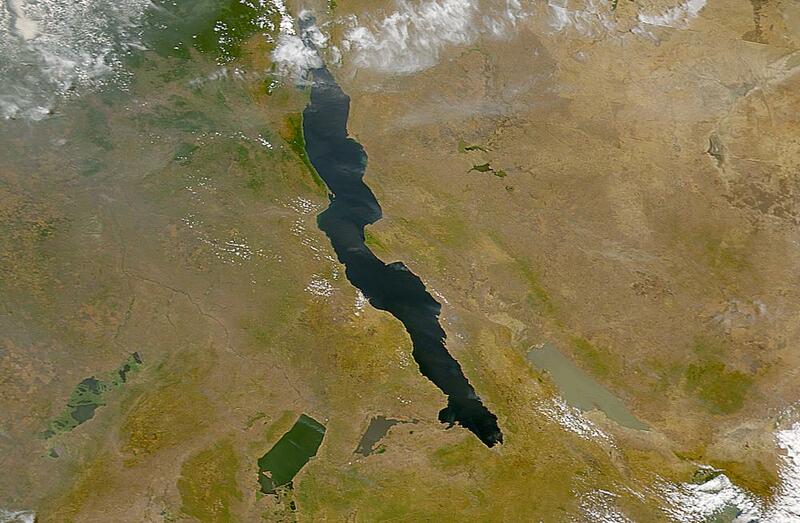 In their day, these basins probably resembled today’s rift valleys of eastern Africa. Rift valleys caused by continental collisions. Although compressional folding and thrust (reverse) faulting dominate continental plate collisions, rifting associated with normal faulting may also take place. A bulge on the edge of one of the converging continents induces rifting as it pushes into the other continent. In a complex manner, rifting on the continent with the bulge takes place, but it occurs at some distance beyond the axis of collision. In this way, relatively isolated rift valleys can form, such as the RHINE grabben in the HINTERLAND of the ALPS. The Lake BAIKAL grabben, although a great distance from the Himalayan mountain system, probably formed in the same manner.